Fresh from his hot remix on Strictly Rhythm is Arnaud D, with his second release on Makin’ Moves entitled ‘Life’. The track features the awesome spoken word talents of Rescue Poetix from New Jersey, USA who you may remember performed on ‘Basement Stomp’ so it’s great to have both of these artists coming together for another release on the label. Poet and singer Rescue writes this song from the heart of the dancefloor almost speaking through the speakers at you.. ‘Can you feel it, i can, can you see it, i can. Can you taste it, i can, the rhythm i see you feeling it on that dance floor. Let go, close your eyes, let it speak to you, life is music, music is life… When it finds you, that life, that music it breathes through you, music, becomes your breathe. Jamesey and Matt have been playing ‘Life’ for the last 6 months at their events and seen people literally losing it on the floor with it’s combination of deep bouncy groove and haunting harmonies. It’s an instant head nodding track and has great cross over appeal to the deep house heads. There’s four mixes for you to choose from and all warm up the floor nicely, expect to hear this played a lot over the summer and beyond. Exclusive promo available via Traxsource.com Monday 20th July, available all other download sites Monday 14th August 2015. 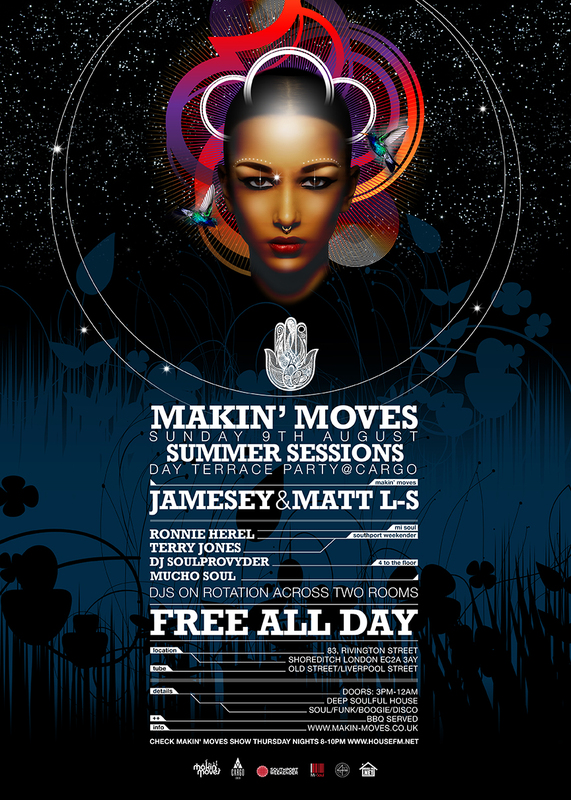 Makin’ Moves continue their series of summer all day terrace parties at Cargo in Shoreditch on Sunday 9th August. Again Jamesey and Matt L-S our residents will be providing their unique brand of deep soulful house and laying down exclusive music from their label in arch 2. The boys will be joined by some of their dj friends including Ronnie Herel and Martin Lodge from Mi Soul Radio and Terry Jones who will be providing soulful house, soul, funk, boogie out on the terrace for 9 whole hours!